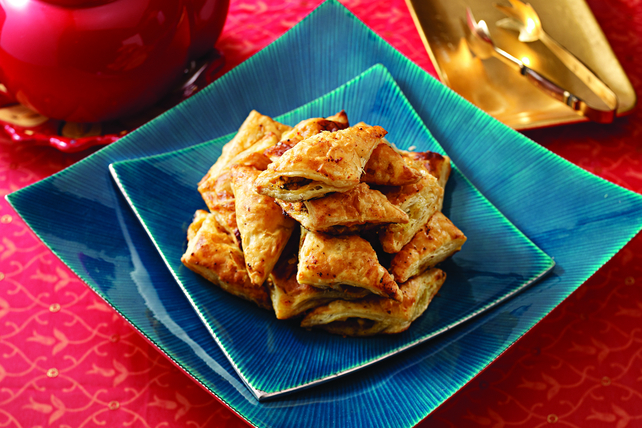 The feta cheese and roasted red pepper dressing team up to add both creaminess and the perfect touch of smoke flavour to the filling in these delicious samosas. Heat oil in large skillet on medium-high heat. Add next 4 ingredients; cook and stir 3 min. or until onions are crisp-tender. Stir in chicken and seasonings; cook 5 min., stirring frequently. (Chicken will not be done.) Remove from heat. Stir in cheese, 1/4 cup dressing and coriander. Refrigerate 15 min. Meanwhile, heat oven to 400ºF. Roll out 1 pastry block to 9-inch square on lightly floured surface; cut into 3 (3-inch-wide) strips. Cut each strip into 3 (3-inch) squares. Dust squares lightly with flour; stack on plate. Repeat with remaining pastry block. Spoon about 1-1/2 Tbsp. chicken mixture onto centre of each pastry square; fold diagonally in half. Firmly press edges together to seal. Place on baking sheet; brush with remaining dressing. Bake 18 to 20 min. or until crisp and golden brown. For easier cutting, partially freeze the chicken breasts before cutting as directed. Prepare using 1 pkg. (450 g) frozen pre-rolled puff pastry sheets, thawed. Serve with Creamy Coriander Chutney or Simple Sweet'n Sour Chutney.